There is something so exquisitely inviting about the way in which B.G Thomas writes. From the first sentence to the last you are engaged, invested and involved with all of his characters both major and minor alike. The connection is tangible and is grounded in a sense of familiarity as we are reintroduced to old friends from his previous body of work. Anything Could Happen is about discovering through those around you exactly who you are. Growing up in a small town and struggling to silent the increasingly incessant cries of his true self Austin risks it and only to lose it all in one night when all he fights to hide explodes in a moment of passion. He courageously puts it all on the line and when his best friend makes a rapid exit from the events of the night only to return to witness Austin making yet another mistake he is left alone. His best friend flees and cuts off all contact. Desperate to find his friend Austin moves in with his Uncle Bodied in Kansas City. Although things don’t progress as he plans what Austin finds are comrades, friends who are just like him, and a future independent of his past. Finding support, love and acceptance in those he thought would turn away allows Austin to not only find these in himself but to pass them on to those around him. I loved getting to know not only Austin but also Guy and especially Uncle Bodie and Lucille. B.G Thomas doesn’t just focus on Austin and Guy but brings great life to all his characters from those just passing through to those bonus few whom give the story extra heart, extra soul and such depth that you feel their life as surely and as fully as you feel Austin’s. Austin’s story is a follow up The Boy Who Came In From The Cold and stands up strongly alongside its prequel. 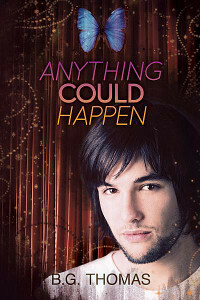 As a stand-alone read or as a must read from a favorite Anything Could Happen is a powerful and moving story that pulls you in and doesn’t let you go. This entry was posted in Uncategorized and tagged anything could happen (novel), reviews. Bookmark the permalink. ← Cover Reveal! My Christmas Story, “Grumble Monkey & the Dept. Store Elf” – Paul Richmond Artist!